In this photograph by Edward DuPuy, actors at the Silo Circle Playhouse rehearse their lines accompanied by a bovine friend. 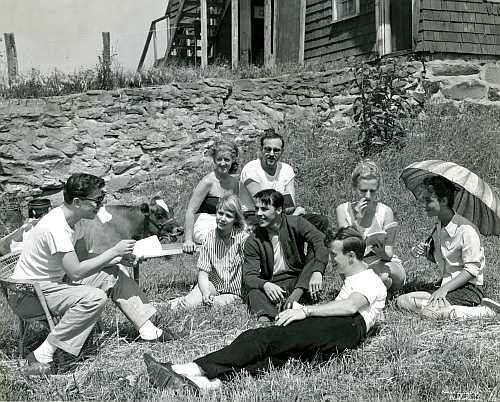 Between 1958 and 1961 a Black Mountain barnyard found new life as a Broadway-style theater during the summer months. A summer stock theater in the Swannanoa Valley was first proposed by young actors and producers Tinka Crawford, Norman Kean, and Dale Meador to the town of Black Mountain in 1958 and aimed to be “fresh in scope,” and “imaginative in ideas.” The fledgling company considered a number of locations for their theater, including properties like old barns and the Black Mountain Airport Hanger. Finally the trio settled on the state-owned cattle barn off highway 70 with a large silo attached to the side. The property once served for many years as a state test farm. The young producers bought and renovated the barn adding lights, a stage and seating areas. Thus, the Silo Circle Playhouse was born. The small summer theater was one of the first theaters in the country to feature arena-style seating, that is, a 360-degree view of the actors as they played. Radio advertisements from WWNC encouraged listeners to visit the theater in its first season emphasizing that, because of arena style seating, audience members would be a part of the “the intimate make-believe circle of new and exciting adventures,” taking place in “an authentic ‘Old Red Barn!’” Despite its rustic feel, the barn was also cool and comfortable in the summer heat, and according to documents like playbills and posters, vices like smoking and spitting were strictly prohibited. Tinka, Norman and Dale worked together to bring professional actors in from all over the country and mingled them with the local talent. They wanted the Swannanoa Valley community to feel as though they had a sense of ownership over the theater. In their proposal to the town of Black Mountain they stated their first desire was, “to give and to become a part of the community by being a part of its business enterprise and be contributing a unique facet of its culture!” Each season they put on a play written by community members, and every Wednesday afternoon held a marionette puppet show of The Wizard of Oz for children. The lobbying of Anne “Tinka” Crawford was essential to bringing the theater to life in the Valley. Tinka lived a large portion of her life in the Swannanoa Valley and graduated from Black Mountain High School. Later, she attended Western Carolina University and graduated from the University of Denver School of Theatre where she met Norman Kean and Dale Meador. She then moved to New York City to pursue a career on Broadway. She acted in children’s and adult theaters and learned how to operate marionettes and sang folk tunes in Greenwich Village. She played with several different theater groups and her career eventually brought her back to western North Carolina in the mid-1950’s when she joined Asheville Community Theater. After working to open the Silo Circle Theater, Tinka helped produce plays for two seasons at Silo Circle alongside Dale and Norman. Despite some questions over whether a summer theater would do well in a small town like Black Mountain, the Silo Circle was a success for several seasons. The company put on seven shows each summer, selling tickets for $2.00 each, or season passes for a discounted rate. Many well known community members and members of the press held season passes and were sustaining members of the company, including community doctors and well known business owners. These included Stuart Nye, the silversmith, known throughout the region for his beautiful dogwood brooches and pendants, and the owners of local shops like Black Mountain Hardware. Patrons came to see all manner of plays and to hear music before during and after shows. Plays ranged from comedies to dramas, some written by amateurs while others were written by the great playwrights of the twentieth century like Tennessee Williams. Often local jazz bands supplied entr’acte entertainment. The opening night of the theater, the “Waynesville Jazz Rats” performed for theater-goers. The theater also featured a small art gallery and sold paintings and photographs as a means of fundraising. In 1959 the gallery featured Black Mountain photographer Ed DuPuy. Unfortunately, after four summer seasons, the theater ran into financial problems and shows could no longer go on. However, for the short time that the Silo Circle Theater was active, it brought professional theater to the Swannanoa Valley. As the first arena-style theater in the state, it was innovative, and creative. It sought to be accessible to the community and to vacationers alike. Now, where the old red barn once stood is the Owen Community Pool. Tinka went on to many adventures, first to Indiana to get her Master’s degree, where she met her husband, Jim Lauer. Together they traveled the globe. Her globetrotting eventually brought her back to the Swannanoa Valley where she opened a tea parlor and antique shop on Cherry Street and became involved with a number of community organizations and clubs. Fortunately, Tinka held onto her records of the Silo Circle Theater. Her records are some of the only surviving historical evidence of the playhouse, save articles published in local newspapers like the Asheville Citizen and the Asheville Times. After Silo Circle, Norman Kean went on to become a major Broadway producer. He produced one of the longest running shows on Broadway, “Oh! Calcutta!” in his own theater. However, his life ended in in a tragic murder-suicide in 1988 when he killed his wife, Gwyda DonHowe (whom he had met while working on the Silo Circle project) and then himself. Dale Meador, his college buddy and fellow Silo Circle producer, went on to work in minor film roles throughout his career. This post was written using sources from the Silo Circle Theater Collection housed at the Swannanoa Valley Museum & History Center. They were donated to the museum by Jim Lauer in 2007. If you would like to use the collection for research you can explore the finding aid here.